For the US stock market, good news is bad news. The Fed is waiting for the recovery to strengthen to exit the zero lower bound. When it does, we’ll see a market correction and an end to the current financial boom driven by yield-seeking investor behaviour. The magnitude of the correction will depend on the balance between the extent of the bubble in asset prices on the one hand, and the continuing positive impact of the Oil Price Counter-Revolution on the other. Let’s not get this wrong: the expectation of a genuine recovery in the non-financial economy, such as it is, is almost entirely driven by the near-collapse in the price of energy. The Oil Price Counter-Revolution is better than a Middle Class tax cut, which does not affect the poor or the really rich, both of whom don’t pay much in income tax; but whose consumption is now a larger share than that of the Middle Class. It is a decline in the cost of making every input except people and capital for everyone except the energy firms. Since oil is used in almost every single industry, the impact is very broad, making the oil price the dominant variable for the economy. Hence, the implication of a genuine recovery. 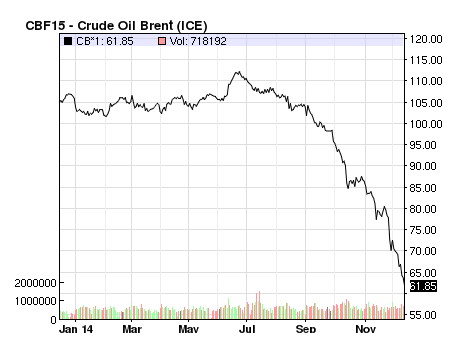 Which brings us to what is happening in the energy markets. The cost of producing solar and wind energy has collapsed to levels last prevailing in the cost of making energy from oil and natural gas in early 2014. The shale boom has continued apace, pushing down the price of gas in the United States to a third of that prevailing in Europe, and a fourth of that in Japan. US tight oil production is increasing relentlessly, so much so that the United States is likely to briefly replace Saudi Arabia as the largest producer of crude. The Kingdom declined to accept lower quotas in the last Opec meeting. The Saudis reckoned that a brief period of benchmark prices in the sixties (Brent is now at $62 and West Texas Intermediate at $58; both were above $100 for a long time) will drive many American tight oil producers with their high costs out of the market, and undermine Iran. It is wrong on both counts. Some of the impact of higher than anticipated gulf production will be absorbed by a divergence between Brent (Eurasian) and West Texas (American), thereby softening the impact on American producers. And unlike petrostates with their fiscal burdens, private American oil firms can survive at much lower margins by cutting costs; expanding capacity when prices revive. A prolonged period of cheap oil will lead to a consolidation of industrial structure, with marginal firms being absorbed by their stronger rivals. But it is unlikely to diminish capacity in the long term. Since tight oil fields get exhausted in a short year or two (regular fields like those in the gulf last more than a decade), American oil production is much more flexible than Opec production in the medium term. Oil firms can easily postpone capacity expansion and let existing capacity erode, thus responding relatively quickly to price signals. Since capital is cheap and credit easily secured, firms do not face a financial constraint on capacity expansion either. And if prices continue to slide, they can shelve plans to expand capacity and buy back their own shares to maintain their stock prices. The United States has too deep of bench of innovative oil firms. The Saudis cannot eliminate American competition by aggressive price-cutting. Aggresive price-cutting can certainly hurt Iran. But that is at least as likely to backfire geopolitically on the Saudis as otherwise. Iran is already in dire straits economically due to the sanctions regime. Further pressure will quite likely undermine the hawks who are holding back on a nuclear deal with the United States. American and Iranian geopolitical interests have converged remarkably since the rise of the Islamic State. Both now very nearly want the same thing in Iraq and Syria. A greater willingness to compromise on the part of the ayatollahs, a likely result of great fiscal pressure, is very likely to clench the deal. Iranian businessmen are already rubbing their hands. More generally, the revival of American oil production has dethroned Opec. The cartel no longer enjoys the extraordinary power it wielded in its heyday. If Iran returns to the market and Western capital underwrites an expansion of Iranian capacity, Opec itself would become bipolar. Without a thaw in Saudi-Iranian relations, it would become defunct. In either case, if Iran returns to the market in force, Saudi Arabia’s status as the swing producer will assuredly be undermined. And with it perhaps, the leverage that the Saudis have enjoyed against their protector since the Islamic revolution. Not so sure about this comment, as we see energy-related credit spreads exploding. 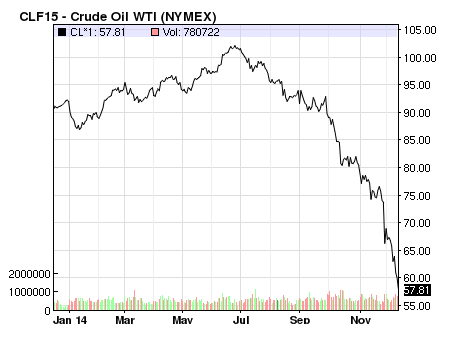 I suspect this will cause the US shale industry to fall by the wayside, as funding vanishes, along with cash flow. 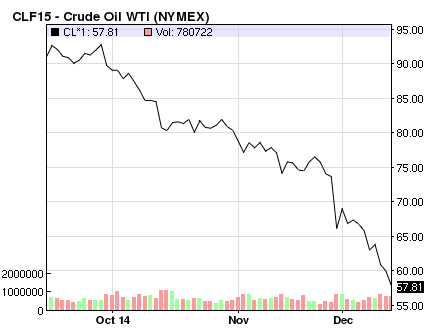 Also, I do not expect the falling gas price to make much difference to the US economy, or indeed elsewhere. The Minsky moment has come and gone, everyone knows the ‘recovery’ is fake, and so gas savings will not be spent, rather saved or used to reduce debts. Policy makers are now pushing on string, but they will keep pushing no doubt. No no, I meant that WHEN firms need to expand capacity (that is, when prices rise again), they will not face a financial constraint. In that event, energy related credit spreads will narrow as well. I agree that policymakers have been pushing on a string. In particular, the markets have been dancing to the Fed’s tune for five years now. But I wouldn’t rule out a robust recovery going forward, owing simply to the collapse of energy costs. Basically, I expect the income effect of the price change to overwhelm other variables, at least now that the process of repairing household and firm balance sheets has mostly run its course. I don’t share your view on the beneficial effects of a falling oil price, or a sustained recovery, rather I think the latest bubble is already bursting, and trouble looms large. We shall see.